Parcel&Airport Logistics Private Limited, an Indian solutions provider for postal, parcel and airport logistics, used physical SAN which was extremely expensive for the company. 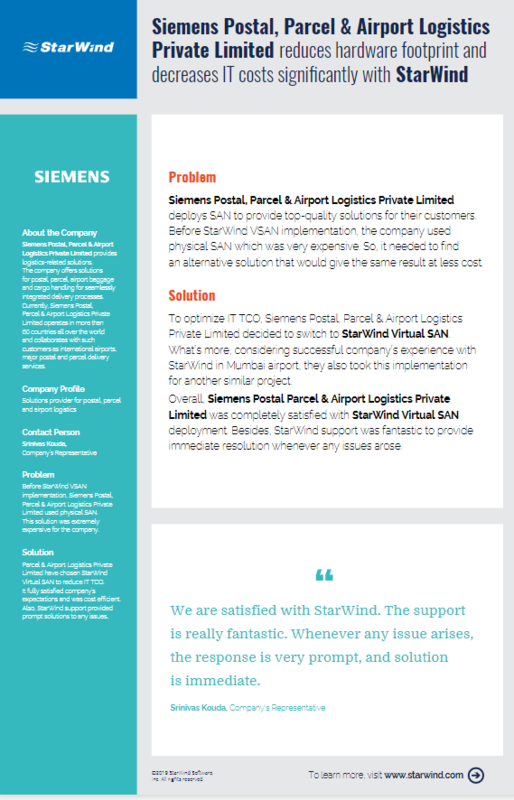 Learn from this success story how Parcel&Airport Logistics Private Limited get the same results at reduced costs with StarWind. Daboula, a Congolese IT consulting company, used obsolete servers in the failover cluster. The existing infrastructure required redundant storage at the physical level on different hardware. Still, it would not ensure uptime in case of failure. 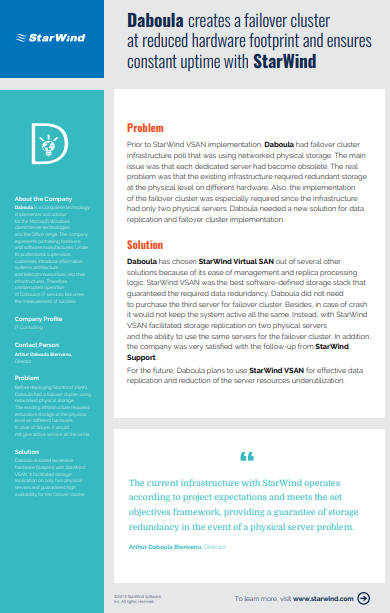 Discover from this success story how StarWind helped Daboula to facilitate efficient storage utilization and avoid downtime. South Gibson School Corporation, the largest public school in Gibson County, Indiana, was running an aged non-virtualized environment. It was hard to manage such infrastructure, and its components required to be replaced. That’s why the organization considered building a virtualized environment. 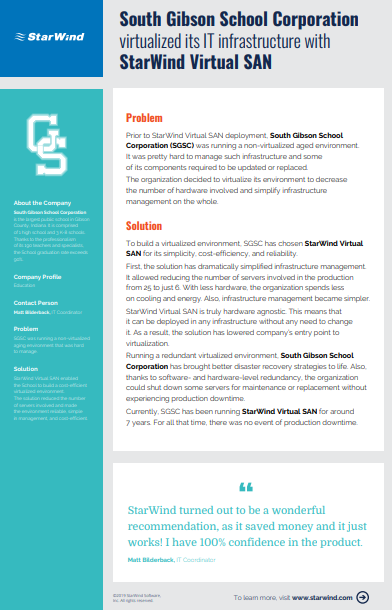 Find out form this success story how StarWind helped South Gibson School Corporation to build a cost-efficient and simple in management virtualized environment. 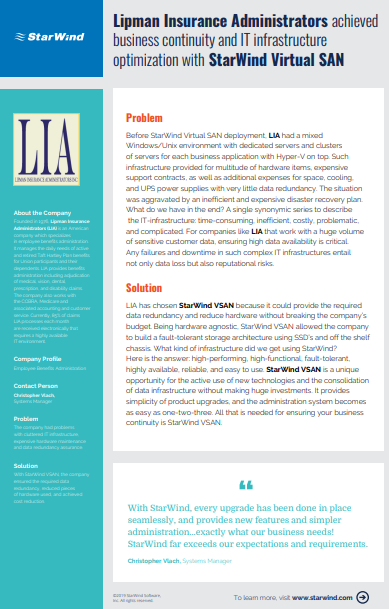 Find out from this success story how StarWind Virtual SAN (VSAN) enabled Lipman Insurance Administrators Inc., a U.S. company specializing in employee benefits administration, to ensure the required data redundancy, reduce pieces of hardware used, and achieve cost reduction across the entire infrastructure. Split Digital LLC, a U.S. company that provides cloud service solutions with high requirements to customization and security levels, had issues with storage speed, infrastructure management and scalability critical for business mission and growth. 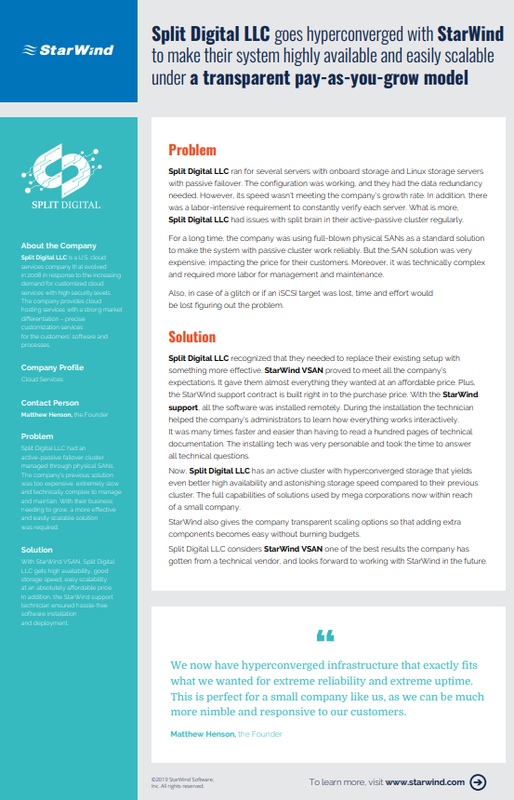 Learn from this case study how Split Digital LLC turn the company’s infrastructure into hyperconverged with StarWind and get all infrastructure performance they required plus the ability to easily scale on demand. 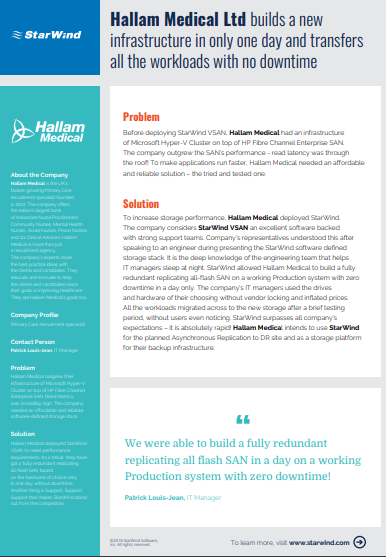 Hallam Medical Ltd, a UK Primary Care recruitment specialist, outgrew the performance of their HP Fibre Channel Enterprise SAN. Discover how StarWind helps the company to migrate to a rapid storage without downtime in only one day.